America’s Cardroom is one of the most successful online poker sites which accepts real money play from the United States. Because Americas Cardroom (ACR) is part of the Winning Poker Network, it has one of the largest communities of poker players in the US gaming market. The size of the community brings with its all kinds of advantages, including a big list of schedules poker events, large guaranteed prize pools, and a stable player rewards program. While you’ll find largest welcome bonuses in the US poker market, you won’t find more a reliable and trustworthy set of welcome bonuses. For American players who enjoy crypto-currency poker, you won’t find a better option. America’s Cardroom is a big site with a lot of tournament events, so new registrants might find the site confusing at first. ACR is a poker site which rewards patience. Million Dollar Sundays: The $1,000,001 GTD Million Dollar Sundays starts every Sunday at 3pm ET. It’s a guaranteed prize pool of a million dollars. Huge Schedule of Events: America’s Cardroom is tied to the Winning Poker Network, the second-largest online poker network which accepts Americans. Dozens of Payment Methods: You name the blockchain payment method and it’s probably available. Visa, MasterCard, and Amex are payment options, too. Casino and Sportsbook: America’s Cardroom has an online casino and sportsbook tied to Bookmaker. This means lots of fish in the poker events. Con: Navigation Is Tricky: With the large number of poker events and ring games, navigating the schedule can be confusing to newcomers. Con: Credit Card Limits: The deposit and withdrawal limits on Visa, MasterCard, and American Express are in the hundreds — not thousands — of dollars. Make a deposit with a credit card or electronic cash transfer service and you’ll receive a $1000, 100% match bonus. The minimum qualifying deposit is $25. New depositors also receive up to 20 days of free cash up to $50. Simply make a deposit on any (or all) of your first twenty days and you receive free cash that day. Also, new players are entered into a $250 New Depositors Freeroll. America’s Cardroom is designed for those who use cryptocurrencies, though. If you make a deposit with Bitcoin, Litecoin, Ether, or one of dozens of other crypto-currencies, you’ll receive a supersize 200%, $1000 welcome bonus. That means you’ll only need to deposit $500 to max out the deposit bonus. Blockchain depositors also receive the 20 free days of cash offer, as well as entry into the $250 New Depositor Freeroll. America’s Cardroom has a massive number of banking methods. You can choose from 48 deposit methods and 45 withdrawal options. Most of these include crypto-currency payments, but those who don’t want to use Bitcoin or its competitors still can make deposits using Visa, MasterCard, Amex, or Ria. Most of the best advantages come with using Bitcoin, Litecoin, Ethereum, Bitcoin Cash, or Dash. If you ever wanted to pay using another blockchain payment method, ACR is the poker site for you. America’s Cardroom has 48 deposit methods, including 44 blockchain payment options. Players can make small deposits using Visa, MasterCard, and Amex, though Visa is the only credit card which supports withdrawals. Ria Money Transfer (Euronet Worldwide), an electronic money transfers service associated with remittances, also is a usable payment method. Poker players also have forty-four cryptocurrency deposit methods. High rollers should use Bitcoin, Bitcoin Cash, Litecoin, Ethereum, or Dash to make deposits and withdrawals. All five have a max deposit of $25,000 and max withdrawal of $10,000. The remaining 40 cryptocurrencies have a minimum deposit of $50 and max deposit of $4,500. Incredibly America’s Cardroom also offers support for Komodo, DigiByte, Stellar, Cardano, Salt, Qtum, Bitcoin Gold, Gnosis, Decred, RCN, LBRY Credits, Potcoin, districox, OmiseGo, Basic Attention Token, Swarm City, WeTrust, Tether, Edgeless, Aragon, Bancor, Wings, Lisk, Civic, Maidsafe, Matchpool, NEM, Numeraire, Nxt, Golem, GameCredits, iExec and Storj. Another 22 blockchain payment methods are listed at America’s Cardroom, but are temporarily disabled: Ether Classic, Monero, 0x, Reddcoin, Status, Siacoin, Startcoin, Steem, Voxels, FirstBlood, Blackcoin, Clams, Vertcoin, Vericoin, Monacoin, Omni, Neo, Nubits, Novacoin, Peercoin, Namecoin, and Factoids. Any of these crypto-currencies might become available again on the ACR website, but I suspect some are permanently disabled. Only a certain number of blockchains are going to be successful. America’s Cardroom has 45 withdrawals methods, including 42 blockchain payment options. Of the cashout options which do not use blockchain technology, players have the option between Visa, Person-to-Person, or Bank Draft (via Genck). Players wanting to cash out with a crypt-currency should focus on Ethereum, Dash, Bitcoin, Litecoin, or Bitcoin Cash. These have $10,000 withdrawals and up to 5 payments in a week. The remaining 37 blockchain withdrawal methods have a minimum withdrawal of $100 and a maximum withdrawal of $4,500. Ripple and Eos, two cryptocurrency deposit methods, do not support withdrawals at America’s Cardroom. Once again, America’s Cardroom also offers withdrawal support for Komodo, DigiByte, Stellar, Cardano, Salt, Qtum, Bitcoin Gold, Gnosis, Decred, RCN, LBRY Credits, Potcoin, districox, OmiseGo, Basic Attention Token, Swarm City, WeTrust, Tether, Edgeless, Aragon, Bancor, Wings, Lisk, Civic, Maidsafe, Matchpool, NEM, Numeraire, Nxt, Golem, GameCredits, iExec and Storj. America’s Cardroom has a mobile download for Android and iOS. In the top left corner of the homepage (or most pages) in the main menu, you’ll find a link that says “Mobile”. Click on the mobile page and you’ll find instructions for download using either Android or iOS (iPhone, iPad). The site updates its poker client several times a year to assure compatibility with the latest Android smartphones and tablet computers, iPhones, and iPads. On the Mobile FAQ page, when asked what is compatible with ACR, the site’s owners reply, “Most iPhones from the last 5 or so years will support our mobile poker experience.” The same goes for top Android brands like Samsung Galaxy, Sony Xperia, LG V40, Huawei P20, OnePlus 6T, and Google Pixel. Obviously, the higher quality your mobile device’s screen and systems are, the better your mobile poker experience will be. ACR has Texas Hold’em, Omaha, and Omaha Hi/Lo cash games and tournaments. Seven-Card Stud is available, too. Those are the basic poker variants, but the variations on those basic games are dizzying. You’ll find guaranteed tournaments, satellites, steps, specials, private tournaments, and many freerolls. Players can choose among high roller, medium stakes, lower roller, and micro stakes events. ACR even has “Points Only” and “Play Money” poker tournaments. If you look through the schedule of events, you’ll find poker tournaments at every reasonable buy-in. If you don’t find an event you’d enjoy, you can create an On-Demand event. When enough players enroll, the poker event happens. If you don’t like poker tournaments, you’ll find cash games for high, medium, low, and micro stakes. Those who prefer poker tournaments have a huge number of options. America’s Cardroom has a wide variety of tournaments. Players can enjoy Multi-Table Tournaments (MTTs) or several types of single-table tournaments (STTs). The STT schedule includes sit & go events, sit ‘n go satellites, or On-Demand Tournaments. Players can enjoy Rebuy events, Final Table Experiences, Knock Out Tournaments, Time Based Tournaments, or Re-Entry Tournaments. You can also choose from Flip Tournaments and All-In-or-Fold Tournaments, which require a player to go all-in anytime they make a call. Each type of poker tournament comes in a No-Limit, Fixed Limit, and Pot-Limit options. If you have a type of poker tournament in mind, keep searching and you’ll find exactly what you want. In true patriotic fashion, America’s Cardroom using military ranks for its loyalty program, which is called “Elite Benefits”. Ranks include Lieutenant, Captain, Major, Colonel, General, and 5-Star General. Benefits include cash rewards and earning bonuses, including the Combat Point Multiplier. Each rank gives a player an additional half-point multiplier, so a lieutenant is at 1x, a colonel receives a 2.5-point multiplier, and a 5-Star General receives a 5x point multiplier. Other benefits include points earned in a weighted contributed rake, site freerolls, and the amount of cash available for purchase. 5-Stars receive $10,000 cash available for purchase. Higher ranked players also can see the levels of distinction of opponents (“declassified”). To send an email to Americas Cardroom, use the address support@americascardroom.eu. Contact support using the number 1-888-878-1350 if you prefer to use a phone. To learn how to making an international money transfer, dial 1-877-314-4195. 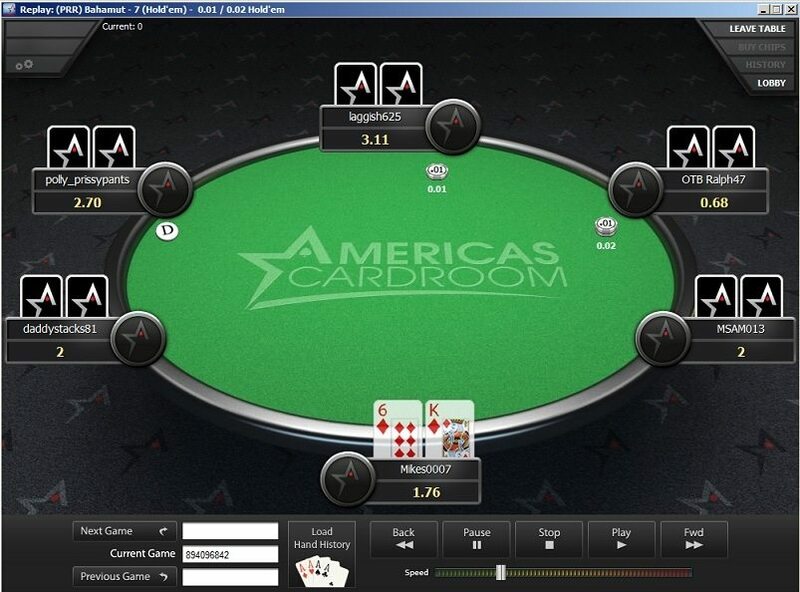 Live Chat is located on a red tab on the left side of any page at America’s Cardroom. You’ll need to enter a name, email address, username, and question to receive a response. Press submit to initiate the conversation. For beginners, America’s Cardroom is a lot to take in. Especially when you enter the player interface, you’ll find an avalanche of game options and other information. Take your time, use the various menus to navigate the schedule of events, and you’ll unlock a whole world of online poker. ACR is worth the time it takes to learn the poker client. Once you learn the website, you’ll find surprises like the 6+ Hold’em tables, the Maximizer, and hand history tools. America’s Cardroom is one of the biggest US-friendly online poker sites on the Internet, so it has the poker game you want to play (usually at a time convenient for you). America’s Card Room has an online sportsbook tied to the Bookmaker sports betting community and an online casino. While these seem like an afterthought, these additions assure card players they’ll find enough fish at all bet levels.